Part 2 of my review of Gareth Evans’ The Responsibility to Protect. The subtitle of Evans’ book is: “Ending mass atrocity crimes once and for all.” This is ambitious, perhaps hubristic. The subtitle may of course be a publisher’s conceit””having myself been the victim of poor editorial decisions (most newspaper readers don’t realize that it’s the copyeditor and not the author who chooses the title to an opinion piece) I don’t want to rush to judgement on this. But managing public expectations is an intrinsic part of the politics of R2P. And if ending these crimes is indeed the ambition of R2P, or widely believed to be so, then the perils of inflated expectations come into sharp focus. All things being equal, any increase in peace-related activities is a good thing. Prima facie, R2P is an impetus to peace and protection and therefore a good thing. Surely, expanding the norm can do no harm. But individual cases of peace-making can go badly wrong. While it is the belligerents themselves””cynical, ambitious or greedy political leaders””who start or restart wars, diplomats including peacemakers can inadvertently contribute to the conditions in which they do so. There is a considerable literature on why peace agreements succeed in certain cases but not in others. One of the emerging lessons is that it is a mistake to create a situation in which a belligerent party (or a former belligerent or potential belligerent) faces the risk of losing everything through a civil political process, such as a winner-takes-all election. The high normative standards appropriate for legitimizing a government in a nation with a long history of rule-governed political competition, may be a destabilizing factor in a country riven by distrust with weak or politically-biased governing institutions. We saw these dangers in the Rwandese and Angolan peace processes: they translated high-stakes civil wars into equally high-stakes political process, contested by ostensibly civilian political parties each of which had armed wings. The peace agreements were ambitious and covered a wide range of civil and political rights””political liberalization shock therapy. As the bar of success was set higher, the downside risks of failure increased commensurately. Underequipped and poorly prepared peacekeeping troops were sent to hold the ring. The peace formula first tried in Angola assumed that the loser in a competitive election would accept the result as legitimate. It was not a valid assumption and the outcome was disastrous. The inaction of the UN forces in Kigali as the genocide was launched was a scandal. Part of the lesson learning is: make sure peacekeepers are properly equipped and mandated. But another lesson, less noticed, is that the ambitious scope of the peace agreement and the breadth of mandate given to the UN peacekeepers raised the stakes. When foreign diplomats sign as “guarantors” and send troops they send a signal that they have a high level of commitment to uphold human rights. They sent this signal in the 1993 Arusha peace accords, which was a model in terms of including human rights provisions, and Rwandese human rights activists took them seriously. They stepped out of the shadows, expecting to be supported. But the international commitment was an empty promise. Some of those who stepped forward were the first to be murdered in the genocide. The conventional human rights critique of this situation is to place criminal guilt on the killers and to lambast the internationals for not sticking to their obligations””especially when they had made specific promises. These are fair points. It would also be fair to criticize diplomats if they had not included human rights provisions in the peace agreement. By setting the bar too low, they could be unduly cautious or cynical. But it is also fair to counsel against pushing governments and international civil servants to make formal commitments that may turn out to be worthless pieces of paper. Better a small real step than a bold false one. Angola and Rwanda were among the greatest disasters of the pre-R2P days and we cannot use them to castigate R2P. But they show how important it is to read history in a critical manner. We can see the disasters as caused by failures of political will to live up to universal norms””making our task to bring capacity in line with the obligation. (Making “can” match “ought”.) We can also, with equal validity if less ethical appeal, see them as caused by unrealistic norm inflation””and our task as matching obligation with capacity. (Making “ought” match “can”.) Or we can attempt a middle way. One of the benefits of the R2P framework is that it allows us to see a continuum of civilian-protection related activities that should be undertaken by international peacekeepers. These range from educational activities (teaching human rights principles to combatants) through monitoring and civilian policing, to deterring violence by military deployment and aggressive armed intervention. It shifts the onus of responsibility for peacekeepers””the default option is not passivity (as in Kigali or Srebenica) but assertive protection. This is the sharp end of the doctrine, where R2P moves from being an abstract principle to a practical challenge. The phrasing “responsibility to protect” throws up problems of interpretation and expectations management. These problems are not insurmountable but they are real nonetheless. 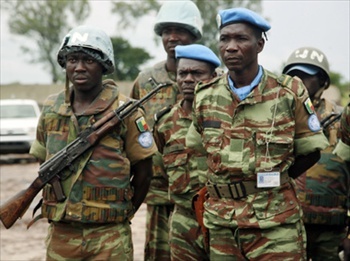 How should a peacekeeping mission define “responsibility”? And what is the measure of success? The target of civilian protection for a peacekeeping mission could be defined in various ways. It could be the ambitious task of providing effective physical protection for a civilian population. This would amount to taking on the role of a national police force””and moreover a highly effective force. It is almost impractical in large and ill-governed territories and also leaves the mission with no realistic exit strategy. At the Abuja peace talks for Darfur, military advisors estimated that 250,000 troops minimum would be required to provide this measure of protection. It wasn’t feasible. And setting the bar this high would be a recipe for failure. Protection responsibility could be also be defined as being mandated to use force (or threaten to do so) when necessary for immediate civilian protection without needing special authorization from headquarters. Peacekeepers would not be obliged to protect all civilians all the time, but if their activities brought them into a situation in which force could usefully be used to prevent attacks on civilians, then they should be ready to use it on the spot. A comparison here is the general duty of British colonial officers in India to administer their territories with the utmost parsimony, including restricting famine relief to the most needy, which was combined with a specific injunction to alleviate actual starvation wherever it was encountered. Protection responsibility for peacekeepers also includes numerous less dramatic tasks such as patrolling, building confidence, identifying danger spots and monitoring them, etc. Once the norm is accepted, the peacekeeper accepts that his or her default option is to act in support of protecting civilians, not to demand special authorization for each of these activities. This is an asset to the peacekeeper but also a burden and a challenge. It is much more difficult than traditional Chapter VI peacekeeping. Each operational decision needs to be calculated, and there are dangers””moments at which peacekeepers are in real danger. Insofar as these are military activities, they run the risks of inadvertent or planned escalation. A local belligerent can call the bluff of the peacekeepers or can decide to see how many fatalities the UN force is prepared to take before it quits. Operationalizing R2P demands day-to-day political and military judgement. Insofar as this new, improved modus operandi decreases human suffering it will count as a success. But insofar as R2P also functions as a global public norm, we have a problem. Implicitly, we are also setting a gold standard for peacekeeping missions with R2P mandates: not just decreasing violence but ending it. We see this in Darfur. The reduction in violence from the peak of 2003-04 to the levels of today should be counted a success, and part of the credit for this should go to AMIS and UNAMID. But the fact that there is ongoing violence including occasional atrocities that may qualify as war crimes means that international public opinion defines UNAMID as a failure and disparages or condemns its leaders who point to its limited successes. The greatest challenge to operationalizing protection is with a full-scale military intervention. This has real perils. A failed coercive exercise in R2P””another Mogadishu””could set back the entire enterprise, just as the Mogadishu debacle was a contributor to the U.S. timidity over Rwanda. My central objection to intervention has always been that it won’t work””and what we cannot do, we should obligate ourselves to try to do. In almost all of the “R2P cases” that exist today, military intervention is not on the cards. And if the non-coercive measures within the R2P stable work, it should never be required. In fact, given that in the situations of greatest danger of mass atrocity there is usually an international presence including military forces, the operational principle of R2P should help prevent those situations from escalating out of control. These are limited coercive actions but short of wholesale aggressive armed intervention. For example, it is widely acknowledged that some relatively limited disarmament and protection actions by UN forces in Rwanda in late 1993 and early 1994 could have halted the planned genocide. Both the R2P principle and developing operational norms of peace support operations have pushed the boundary of what counts as “armed intervention”. There are now intermediate, small-scale coercive peace support measures that are legitimate, even routine. This is an advance. But it does not address the issue of the exceptional case””the tiger. The most important argument against the inclusion of coercive intervention within the same norm as conflict prevention and peace support operations is, I believe, the error of trying to legislate on the basis of the exceptional case. If the extreme or exception is contained within the general principle, then there is a slippery slope towards that extreme, which becomes the center of gravity of the entire principle. If the tiger is stabled with the donkeys, it rules the stable””even if it only roars occasionally. Evans’ response to this challenge is to tame the tiger. The ICISS report contains five criteria which determine when a military intervention should be considered legitimate: seriousness of harm, proper purpose, last resort, proportional means, and balance of consequences. The hope is that by removing these claws from the tiger, it will lay to rest the charge that R2P is a “Trojan Horse” for neo-imperial intervention. But has Evans de-clawed the tiger? Take the “last resort” criterion. This means that in some situations when it is truly needed, the intervention will be too late. Most of those killed in Rwanda were murdered in the first three weeks of the genocide. The last resort criterion for legitimate armed intervention is such that it would have been extraordinarily difficult to obtain consent in any diplomatic forum, let alone the UN Security Council, in this space of time. Reaching a decision to act would have been very difficult even within a single government. Operation Restore Hope in Somalia was launched when the famine was largely over. The first AU troops arrived in Darfur in May-June 2004, when most of the violence was over (though there is good reason to believe that they played an important role in reducing the killing too.) To be effective, the resort to force has to be rapid. The rapidity problem is implicit in the somewhat unsatisfactory treatment of the last resort criterion on p. 144 of The Responsibility to Protect. Rapidity may entail short-circuiting the law. If a rapid intervention works it will be applauded. Each of the criteria is open to a similar critique. Any successful intervention is going to be extraordinarily difficult. The logistical and military requirements for success are phenomenally high. If the procedural criteria are applied rigorously as well they are likely to so constrain an intervention that it is doomed to fail. And””having adopted these requirements for legitimacy””if the get-out clauses are utilized too liberally they run the risk of delegitimizing an intervention that is likely to work. I wish there were a formula that could capture a solution to this conundrum. I cannot see one. Illegality and success may be conjoined. Alex, while taking your point that the UN Security Council was incapable of responding to anything within three weeks in 1994, that should not have to be the case now. Firstly the world of intelligence has been changing drastically over the past twenty years. The internet has led to Open Source Intelligence (OSINT) being recognised as a central, though still largely underestimated, discipline. This is also leading to the de-nationalisation of a significant portion of a number of countres’ intelligence product. The African Union’s fledgling Continental Early Warning System is a case in point, which deserves all the support it can get. Secondly, if UN Reform is taken seriously, and with communications and intelligence in place, the only reason for the Security Council not to be able to respond within 24-48 hours is political will. Why has UN reform disappeared from the agenda?